It’s been a long time since I’ve posted anything, sorry about that. Things have been busy, with not much time for writing. On the work front, I’m starting a new job soon. On the band front, Sun Tunnels is a 4-piece and we’ll be playing at Folklife in a couple of weeks. On other fronts, there is more stuff going on, some of which I’d like to post about. Eventually. 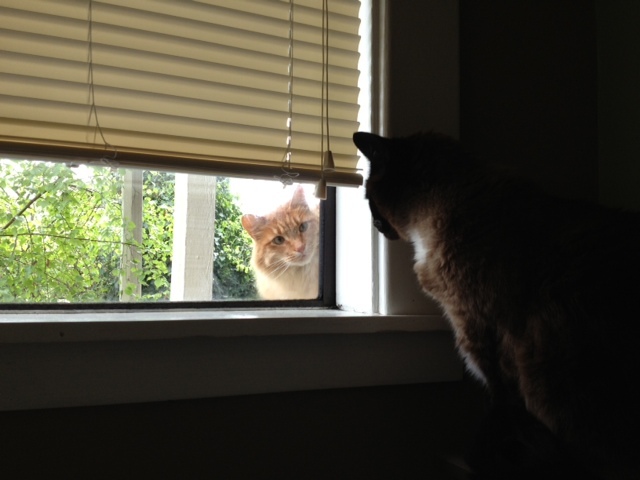 In the meantime, here’s a picture of our cat being visited by a neighbor cat where they’re staring at each other. This entry was posted in Meta, Misc. Bookmark the permalink.